Next post: Okay, venting now. Hilarious. How I wish this were a print book. Of course, to get the joke you have to have read Frank Herbert’s Dune seven or eight times. Who am I kidding, try seventy or eighty times, but it’s worth it. In the far future, the Galactic Emperor is conniving at the fall of the House of Atreides by giving them suzerainty over the planet Arrakis, aka Dune, which is the sole source provider of melange, the spice/drug/worm poop that enables the Guild Navigators to jump spaceships through hyperspace. Of course he is setting them up to fail, and that disgusting floating fat man, Baron Harkonnen, is just waiting in the wings to commence a plan of treachery and betrayal that will leave Paul, the heir of House Atreides, on his own in the desert sands of Dune. But the plans of emperors gang aft agley, and the Fremen of Dune miss a beat in their generations-long project of terraforming their planet to rescue Paul. Together they take back Arrakis and take over the galaxy. Or something like that, anyway. Dune was first published in 1965 and in the same way that Heinlein’s Stranger in a Strange Land became the bible for the Summer of Love, Dune became an inspiration to the environmental movement. Or you can watch the David Lynch film. It’s pretty awful, but it looks great and it was extremely well cast. The de Laurentis film was awful. Another case of a great book thoroughly butchered by bad screen writing and direction. But the TV miniseries was quite good as was the sequel, “Children of Dune” and both were very close to the books. As a long time fan of Herbert’s work and having read the series multiple times, I felt the miniseries made the books come alive on the screen. Given the budgets for the miniseries, the special effects were good. But neither of them got the true creepiness of the Baron Harkonnen right. Got to get the villains right. 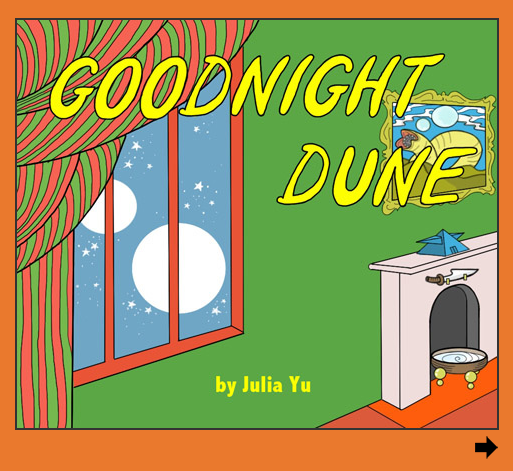 Very funny,,,loved all of the Dune books and, of course, Goodnight Moon… Dana, you are a treasure!